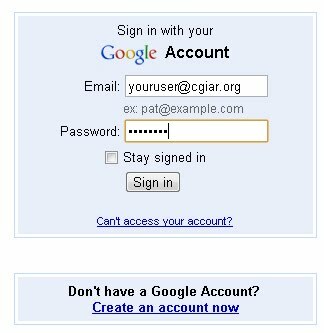 If you are a CGIAR user and came across the following message 'An update to your account is required ' when trying to login to your 'cgiar.org' Google Account; it may be because you have a conflicting account given that you associated your 'cgiar.org' email address to a Google Account in the past. This temporary conflict can be easily resolved, and it is suggested to follow the steps below to solve this temporary issue. So, why did I receive this message? 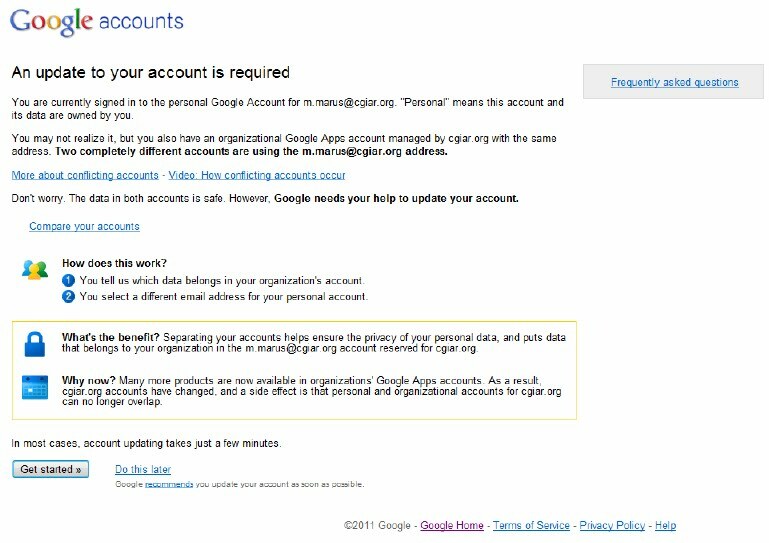 You have probably associated your 'cgiar.org' email addresses to a Google Account and due to the transition of accounts required, you will need to associate the Google data you had on the 'cgiar.org' Google Account to your personal GMail account. What are the advantages of going through this transition? To ensure CGIAR staff can work smoothly with the CGXchange Google Apps, the CGX administrators added the 'cgiar.org' domain as an alias of 'cgxchange.org' which will allow CGIAR staff to work seamlessly with their 'cgiar.org' addresses on the CGXchange Platform. What will happen now is that if someone shares a Google Doc with any 'cgiar.org' address, this will redirect automatically to the appropriate user on the CGXchange Platform. For this reason, having a Google Account associated to 'cgiar.org' is no longer required because we have associated it now by default for the CGIAR users, but you will have to follow these one-time instructions. Will I lose the Google data I had using my 'cgiar.org' account? How can I get started to solve this? It is highly recommended (and required) to select Option 2: Select a different address for your personal Google Account because it is not possible to move all the Google data from one place to another, thus creating an alternate account is the best option for now. NOTE: you will be able to 'share' and re-associate your data to your 'cgiar.org' account after you have completed this transition process with your alternate account. STEP 4 .Decide what kind of account you would like to use as an alternate. Option 1 allows you to create a new personal GMail account (if you do not have one and want one) - or Option would allow you to associate any other email you own (Hotmail Yahoo, etc) to a Google Account which will now become the account which will hold the data you had on 'cgiar.org'. Note: It is highly recommended to use a Personal GMail account (Option 1). Questions: If you have any questions/feedback or run into problems when going through this process, please contact cgxchange@cgiar.org for support.